Llynclys Hall Farm Shop opened in 1995 by us, Richard and Lynda Jones. Our family have run the farm for generations, farming beef cattle and crops, but we decided it was time to diversify, and selling our own crops was the answer. We converted an old workshop into a farm shop, and started growing our own vegetables, buying in locally what we don’t produce ourselves. Since then we have grown to stock a huge range of foods as well as fruit and vegetables while Lynda makes a range of cakes and pickles at the farm for sale in the shop. And we’re also well known for our pumpkins. 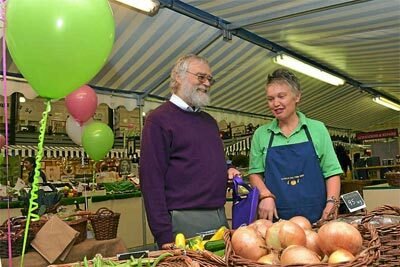 Obviously you can find us at our farm shop Monday to Saturday week, and at our stall on Wednesdays, Fridays and Saturdays at Oswestry Market.